SEOUL, South Korea — South Korea halted anti-North Korea propaganda broadcasts across their tense border on Monday as officials from the two Koreas met again to work out details of their leaders’ upcoming talks, expected to focus on the North’s nuclear program. 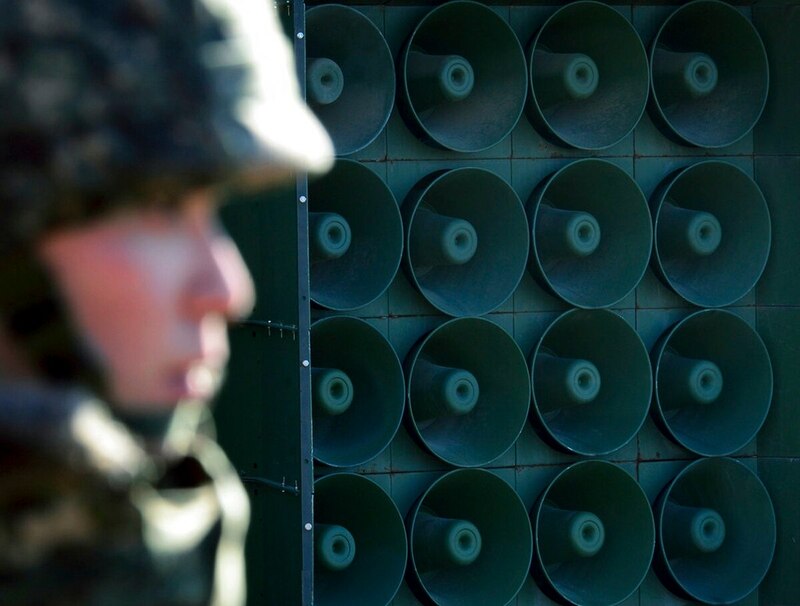 Seoul had been blasting propaganda messages and K-pop songs from border loudspeakers since the North’s fourth nuclear test in early 2016. The North quickly matched the South’s action with its own border broadcasts and launches of balloons carrying anti-South Korea leaflets across the border. South Korea turned off its broadcasts on Monday to ease military tensions and establish an environment for peaceful talks, Seoul’s Defense Ministry said in a statement. It said Seoul hopes the decision will lead to both sides stopping slander and propaganda activities. Yonhap news agency, citing an unidentified government source, said that North Korea was believed to have turned off many of its propaganda broadcasts later Monday. Yonhap earlier reported that some North Korean broadcasts were sporadically heard in the South on Monday morning. 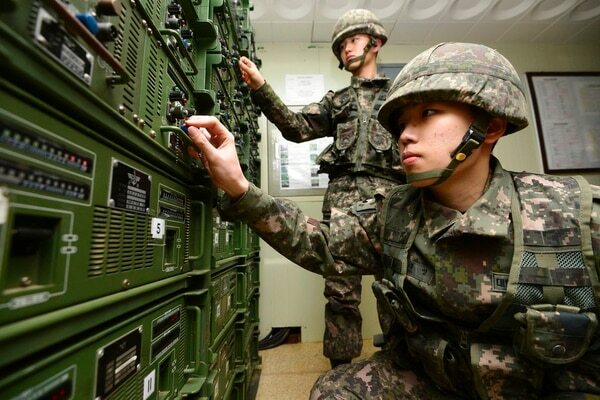 South Korean defense officials said they couldn’t immediately confirm the status of the North’s broadcasts. The move comes amid a recent thaw in animosities, with North Korean leader Kim Jong Un trying to reach out to Seoul and Washington after conducting his country’s sixth and most powerful nuclear test and three long-range missile test launches last year. Kim and South Korean President Moon Jae-in are to meet at the Korean border village of Panmunjom on Friday in the countries’ third-ever summit talks. Kim is to hold separate talks with U.S. President Donald Trump in May or early June in what would be the first North Korea-U.S. summit. On Monday, the two Koreas held a third round of working-level talks at Panmunjom and agreed to conduct a joint rehearsal Wednesday of the summit, Moon’s office said in a statement. It said the two sides agreed that Friday’s summit will include a welcoming ceremony and a banquet dinner as well as a formal meeting between Moon and Kim. The Koreas agreed last week to allow live television broadcasts for key parts of the summit. Monday’s statement said North Korea also agreed on live broadcasts by South Korean media of unspecified events at the northern side of Panmunjom. The Korean summit is to take place at a South Korean building on the southern side of Panmunjom. This means that Kim must cross the border into South Korea in what would be the first such act by a North Korean leader since the end of the 1950-53 Korean War. Kim has said he is willing to place his nuclear program up for negotiation. But it is unclear what disarmament steps he will offer during the two sets of summit talks. U.S. officials have said they want to the North to complete full nuclear disarmament. North Korea said Saturday it will close its nuclear testing facility and suspend nuclear and intercontinental ballistic missile tests. But it stopped short of suggesting it will give up its nuclear weapons or scale back its production of missiles and their related components. Trump’s pick to be the next secretary of state, CIA Director Mike Pompeo, traveled to North Korea on Easter weekend to lay the groundwork for the summit meeting. Pompeo’s trip was a clear indication that preparations for the North-U.S. summit are under way, though many U.S. and other foreign experts have had doubts.